Winter photography got you down? Ready for the long days of Summer already? Well so am I. But not to let a good thing go to waste, I am grabbing my boots and hat and heading out door. 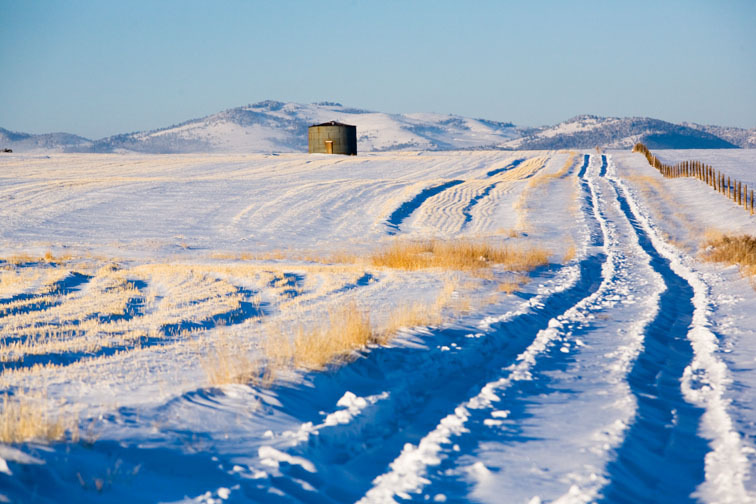 I shouldn’t be so pessimistic about winter, because honestly I really love it, especially in Montana. It’s just as most photographers, I much prefer the colors of summer and all that goes with it. But winter has some great stuff to offer and instead of holing up like a hermit in the office and editing images all winter long, I have decided to be more proactive this year and really get out there and make the most of it. I should be especially grateful right now because we’ve been getting some great winter weather. Some real cold spells, good winds and a lot of dramatic weather. Take a couple weeks back for example. We had nice arctic cold front come down from Canada and bring us some seriously cold temps. We dropped to about -25 below around some of the areas near Helena, with some gusty winds. Now with a clear forecast in the morning with that cold of temps, you know it’s going to be some awesome light and clarity to things. And sure enough it was. 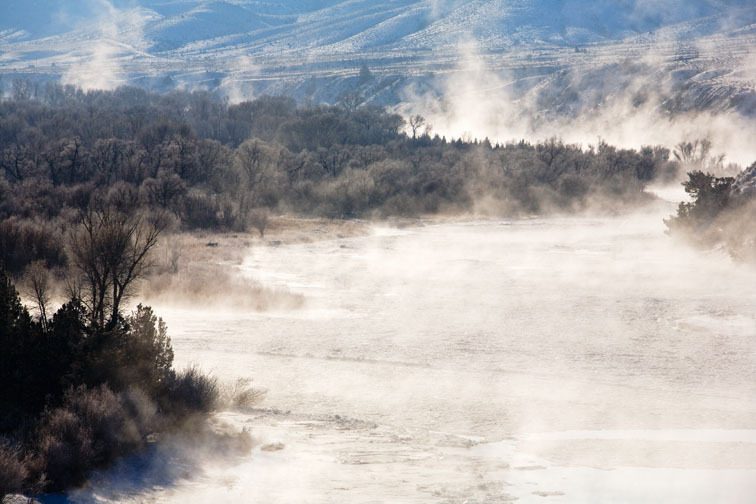 I drove over to the Missouri River near Townsend and hiked down to the Crimson Bluffs area to photograph the river and steam rising off of it. 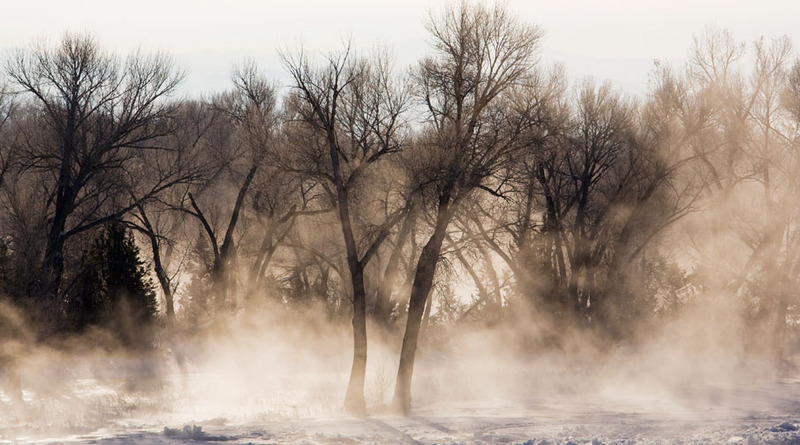 One of the things that winter can bring are some big shifts in weather and I have started to pay a lot more attention to these situations when they have not always seemed ideal. But now I am seeing that they can add real dramatic moods to your images and really make things a lot more interesting. So now when that weather forecast calls for unfavorable weather, look at it as an opportunity to explore some new situations. On a side note: Dealing with digital in freezing temps is a little different than film. One thing is your LCD is not a big fan of 25 below, and neither is your camera of you breathing on the back of it. While you’re trying to figure what your LCD is up to, you have now given a nice coating of frost to the backside of your camera. And a good thing to remember also is to let your gear sit in your bag for a while after bringing it in from the cold. That way it can warm up gradually and not develop a lot of condensation.